Jeremy Thiel: Trigger Point and Eva T.
Trigger Point and Eva T.
Jeff Alexander and Eva T. rolling through the solues muscle on the Trigger Point foot baller. 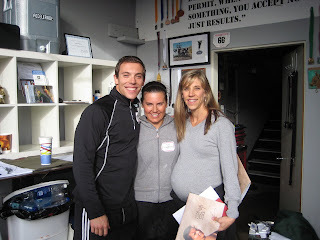 Eva T. Carey Kepler and I at the Crossfit Endurance Training Certification in Hunington Beach California. Eva T. signed her calnder for Carey and I. Wow it Rocks check it out! Eva was the first person to teach me kipping pull ups.